In stock. Order in the next 5 hours, 37 minutes and it will go out today! We are sure that like us, you have had your rubber bands snap on you at the wrong moment. Elastraflex will strengthen any rubber band. This is for rubber bands what a card clip is for cards. Add just a few drops to any rubber band and you'll be amazed at the transformation as it goes from "ordinary" to "extraordinary." Specially formulated to add strength, shine and durability to your rubber bands. 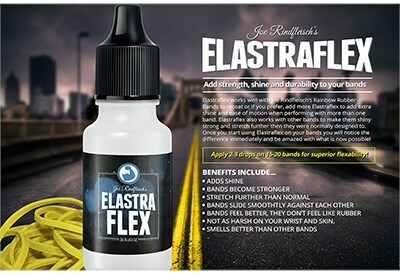 Elastraflex works well with Joe Rindfleisch's Rainbow Rubber Bands to recoat or if you prefer, add more Elastraflex to add extra shine and ease of motion when performing with more than one band. Elastraflex also works with other bands to make them shiny strong and stretch further then they were normally designed to. Once you start using Elastraflex on your bands you will notice the difference immediately and be amazed with what is now possible! Not as harsh on your wrist and skin.